We love to ride our bikes and we love our town; Barcelona. 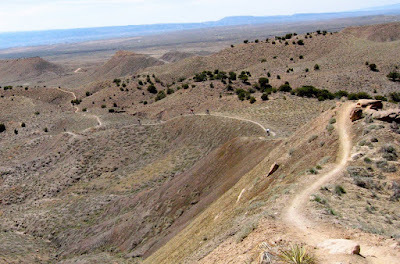 This blog is about our trails, our bikes and our riding friends. If you come to Barcelona and you look at the mountains above town, this is what you will find. 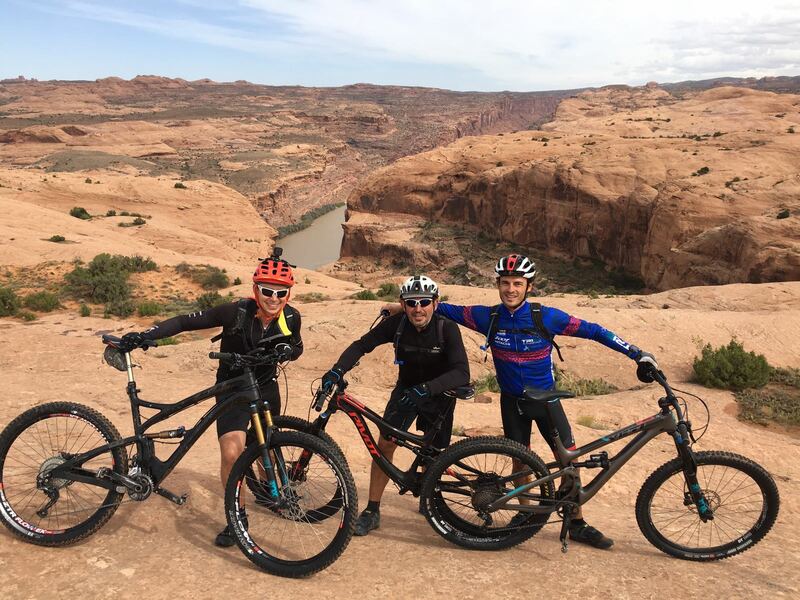 Moab is mountain Bike Paradise. Technical trails and astonishing sightseeing all in a friendly town with lots of possibilities to lodge and eat. There are plenty of bike shops where you can rent great bikes. And if you don’t feel like pedaling a lot, there are shuttles available everywhere. We rented ours from Poison Spider. We wanted to shuttle but we wanted to pedal too, so we rented Allmountain bikes: Pivot Switchblade, Yeti SB5.5, Yeti SB4.5 and a Niner RIP 9. Poison spider can offer you pedals and helmets if you did not bring yours. They set up the bikes and explain you everything about them. IMHO if you’re going to Moab, you may already know how to set up the bike. As per Fruita, finding trails in Moab is pretty straightforward, you find all the trails and how tricky or tiring they might be in www.mtbproject.com. Trailheads are really well signed and there’s always a parking lot to leave your car. By the way, when you rent your bike they ask for the license plate of your car. They say it is in case you get lost and they see an empty car at the trailhead. We got our bikes and headed to Slickrock. It’s a must! It is fun and you have to do it. It is also absolutely physical, all the uphills are very, very steep and explosive. Miles and miles of petrified dunes of slickrock. You won’t believe the grip till you ride this. You can pedal standing uphill grades that must be over 30% and the tires will traction. You can cross water puddles right before climbing some silly wall and you can feel how the tires hold on. So it is something to be done but to us it was the least fun trail in Moab. We knew there was much better to ride! Coming from Europe, where sometimes it is hard to share the trails with people running, horse riding or just walking, it’s amazing how in Moab you share them with Jeeps or motorcycles going through the very same trails. We know they were there first and they were all really polite and cheerful. Nice! If you love mountain biking you have to travel to the US. It’s not only that they invented the sport, not only they design some of the best MTB bikes but they also have some of the best trails you can find. There may be awesome trails everywhere, but in the US they are usually well signed and next to places where you can eat, sleep and rent very good bikes. 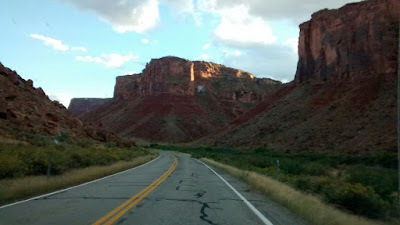 So we went to Moab, but first we wanted to give a go to Fruita which is on the way to Moab from Denver, where we landed … like 20 hours after leaving Barcelona. The road from Denver to Fruita through the Rockys is pretty enough, but we’re here for the ride. We rented our bikes at Otesports. The shop was beautiful, filled up of dream bikes. We rented a couple of SantaCruz (Bronson and Hightower +) an Ibis Mojo 3+ and a BMC 29”. All of them perfect bikes for the area, especially for the Kokopelli loops. I was eager to test a 27.5”+ and we had a couple of them. In my opinion, if you’re used to 29” with at least 5” of travel you don’t need the +, I didn’t feel that I was safer of descended better or climbed more than I did with the BMC or the Bronson. But there were riders on our group who were not that used to sketchy terrain that found them to be safer. These riders came from Epics or even hardtails and for them the 27.5”+ was a blessing! Not so technical trails but fun. Somebody must have spent a lot of money to make and maintain these trails, and it pays! It’s was pretty crowded the Saturday morning we rode them. Although is called the North Fruita Desert and the land is really dry and dusty, it is not much different from we’d find at home in Spain. Mostly hardpack with sandy bits every now and then and some rocks to spice it up a little. The trails go up and down the hills but you won’t pedal up for longer than 30 minutes. We started up with the Chutes and Ladders Loop. The end of it was like a bobsleigh track 15” wide in the middle of the desert, really nice! Then we went up again for a loop of zippity-do-da and this time it was more of a roller coaster with very steeps ups and downs. All in all a perfect beginning to our trip. Not very technical so not to scared some of the group who had read scary things about the trails in Moab. 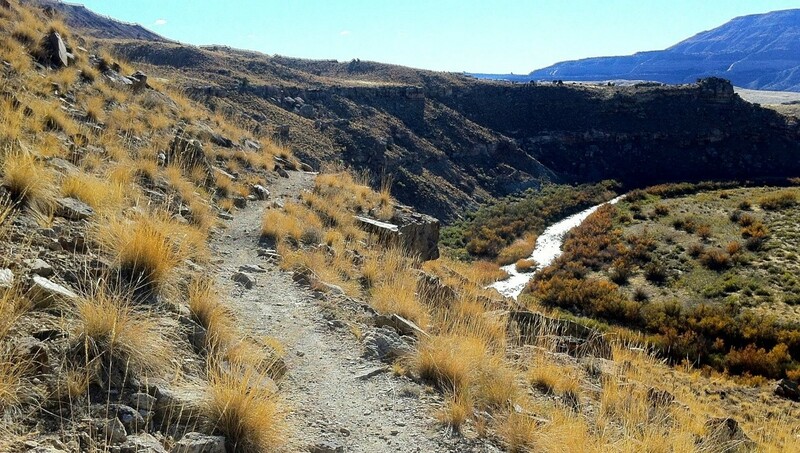 These trails are on the south side of the I70 highway, just 10’ by car from Fruita. This was more the terrain we came looking for. It’s a perfect appetizer for Moab, and it’s really fun to ride. First day we did Horsethief with its very sketchy entry (check youtube) and the second day we planned a longer ride including the ridgeline tour and more. We had to cut it short because it started to rain mid ride and parts of the trails became a nightmare. The parts that are not rocky are just clay and in 5 meters the bike gained like 10 kg of mud. No way to ride it or push it, you had to carry all 25kgs of bike. The rain didn’t last long and the trails dried up very quickly, but if you’re there and it rains; stay in town, there’re enough restaurants and bike shops not to be bored. It’s amazing how bikes have evolved in 5 years. The Genius is a great bike; carbon fiber light full suspension frame with 150mm travel front and rear, twinlock to lock both the fork and the rear shock, rigid enough and fast both uphill and downhill. But when I compare it to my newest bikes, 29” or 27.5”, is not only the wheel size that make the difference, it’s mainly the geometry. Bikes are now longer, stems are shorter, BBs are lower, handlebars are larger, angles are leaner nowadays … and you can feel it riding the same trails. I have noticed how much more rigid new wheels are with through axles. The Scott has a Fox Talas fork with 32mm stanchions, QR and 150/125/110mm travel and you can feel it struggling on rocky singletracks. The bike came with a 660mm handlebar and 100mm stem, at the time (only five years ago!) that was almost Enduro standard. Today even XC racers have wider bars. I switched immediately to a 60mm stem and 720mm bars, I thought more than that would be too much for 26” wheels. Our rides around Barcelona never take us very far away from home. We are never going to get lost in the middle of nowhere, there is always somebody not very far away. We don’t carry with us the same things we would if we were going to the mountains. We also have a big bottle (750ml), a mini pump and a mobile phone. There are plenty of water sources around, even bars! So you don´t often need to carry on more water. It’s important not to forget the money, there’s always a bar on the trail to have a coffee … or a beer! Mountain biking is full of labels, they come and go. Almost nobody talks any more about Freeride but not long ago the press was filled up with freeride bikes. Today the key word is Enduro, everybody is talking Enduro, every month we see find in the press new enduro bikes with more and more travel and less and less gears. Then you have XC bikes with fewer and fewer gears as well and very short travel. Everything in between can be call Allmountain, All Mountain or Trail. To me, these are the real bikes we should all be riding if you're not racing or if you don't live in a flat singletrackless country. These are do it all mountain bikes; 120-150mm front and rear suspension, 20 speed (or 11 with a 28-30 ring), 2.20-2.40" tires and a telescopic seatpost. The size of the wheels is up to you, I rather ride a 29" because it is pretty rocky around here and it makes me feel safer on the steep downhills we often ride. All Mountain is what we used to call mountain biking, just get out there and ride everything that gets in the way and have fun doing it. Of course I rather ride tight singletracks, specially going downhill! It starts at La Colmiane ski resort, at 1500 msl. On race day they make go down the ski track and then up to about 1700m so the groups spread a little. When you get off the ski track you start a nice single, then a jeep road and then, after walking a little, you get to the crest line and you find yourself riding around 2000m surrounded by snowy peaks. The trail is technical enough that you have to keep something to ride up a lot of steps. Little by little you get to the first big downhill where you cross the road coming down from the Granges de la Brasque. It is the first sample of whats to come, narrow, rocky and plenty of switchbacks. It is great if you're used to that kind of trail, but it can be a nightmare if you're scared of rocky steep singletracks. On race day there are people that walk down most of this trails!Just when you see on your GPS that you're going down to Utelle you have to carry your bike up a climb that would be tricky going down, imagine going up! We are now at the top of the most famous downhill in the race, the Brec d'Utelle, some 5km and 800m of altitude loss with all the rocks in the world. This is what we came here for. The transvesubienne is without any doubt the best mountain bike race in France and probably one of the best in the world. It starts in the Alps 80kms north of Nice near the Italian border and finishes in the Mediterranean Sea in downtown Nice. It is about 90km long with over 2500m of altitude gain and 4000m of altitude lost. It takes place every year at the end of May. It takes the best riders 6h30 to complete the race but to end it under the maximum allowed time of 12h30 is already a challenge. I don't like races but I love technical trails and they don't get any more challenging than these, so when my friends in the North of France ask me to go with them to do the recos the weekend before the race I didn't hesitate. If, like I do, you're always searching for scary and technical singletracks you have to come ride these trails. I rode my Santa Cruz Tallboy LTc. You need full suspension and you need travel, at least 130mm for my 29 wheels. You also need big wheels, there are thousands of rocky steps and you need to clear them even when you're dead tired. And of course I think it is impossible to do without a telescopic seatpost. I rode strong wheels with 2.3 Maxxis Highrollers Exo TR. I only had one flat puncture but I consider myself lucky. Most of the downhills are really rocky and filled with loose slate. If it's also wet, as it usually is early morning facing north, the rocks are waiting to cut the sides of your tires. We booked a hotel near the start of the race in the sky station of La Colmiane, but to do the recos it would be better to have your basecamp in the valley near Lantosque so you can do the whole trails in a couple of loops starting from your hotel. It will take you around 6h of mountain biking every day. You need to take a lot of water with you as there is hardly any throughout the track and it can get very hot at this time of the year. And it better be hot, because if it rains the trails get very slippery. Don't forget good gloves, the downhills are very long and demanding and it is easy to get blisters if your hands rub inside your gloves. You also need good shoes, you'll be walking a lot uphill no matter how fit you are! I don't wear protections for knees and elbows, it is not an Enduro race and I prefer to take it easy and (relatively) safe going downhill rather than carrying all the stuff uphill. Now that we're ready let's go for the trails!